I love doing these spring clean your studio blog-hops because they force me to organize a little at least once a year. This year's clean up has been very hard. I have not felt very motivated. I've had one child moving out and another child moving in over the past month and their stuff has been all over the house. 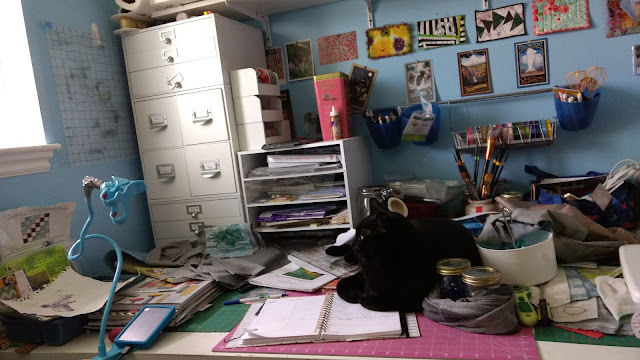 This weekend I decided I had to do something about the messes everywhere. I honestly should have videoed my entire house before and after I cleaned and moved furniture and used that as my post! Hubby was out doing the yard work while I cleaned. The girls were gone and I was very happy about that. It is so much easier sometimes to just do things all by myself. Hubby did, however, help out in the afternoon and I was grateful for his help with the heavy stuff! So, after all that work, I was exhausted and exhilarated! It felt great to have everything back in order. Then today, I came in to the studio. My ever faithful supervisor plunked in the middle. Suddenly I had no more cleaning energy left. But I HAD to do it! I had to get my blog post done! The entire reason to do this now was to have some accountability. I forced myself to get to work. But bit, by bit, it got cleaner and cleaner. Well. . . actually. . . to tell the truth, only part of the studio is clean. I just couldn't force myself to do anything more than this one side. Sometimes half done is good enough!!! Now before someone starts accusing me of just moving everything to the other side of the room, I want to say that I actually DID put everything away in it's proper place. Here's a photo of the other side to show you it still looks pretty much the same. No added stuff. Maybe I can get to this side, and the ironing board tomorrow. In the meantime, I'm going to bed! 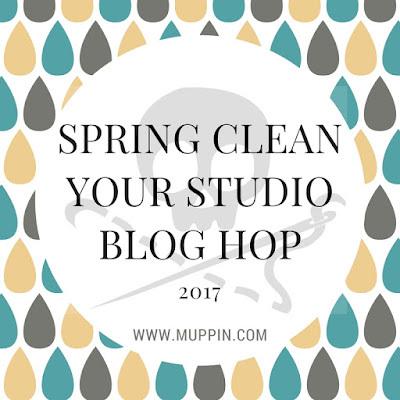 YOU, however, should go visit the rest of the blogs to see the great studios they have and how they have cleaned and organized them for the hop.